Just a quick thanks to the writer of this website, your information you kindly took the time in writing has in my humble opinion, has been both knowledgeable and absolutely correct. I have just installed the above unit in my home. http://doctordetox.co.uk/2-person.php. The company is easy to deal with giving plenty of support. It was easy to put together and had great easy to understand instructions. As one can imagine there is plenty of wiring which looked daunting at first, however these were clearly labeled with large fonts which made it very easy! It was put together in under 30-40 minutes. Only needing a small and large philips screwdrivers. This is a reasonably expensive unit about 2.5K but I must say it seems really good value and I like it a lot! Control panels both inside and out which seem very responsive to the touch, again clearly legible. 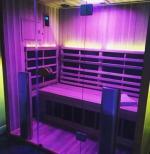 The unit benefits from a light therapy in the ceiling which is very nice for a different feel. My only grumble is I should have bought a larger unit so I could lie down and go to sleep as it is very relaxing indeed! So if you have the room get the largest! My family and I are looking forward to really using the unit and hopefully achieving better health and well being.